Are you looking for a better golf experience? Metro Ladies Golf has it for you! 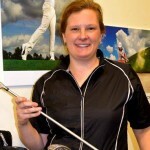 Proudly owned and operated by Sara Wilson, a PGA of Canada golf professional, an expert teacher and coach with over 20 years of experience in the golf industry. Sara’s goal is to remove the barriers that prevent women from playing and more importantly, enjoying the game. Her club brings together women of varying golf skills, from beginners to advanced, and guides them through the golf experience. She offers a network of like-minded women who enjoy organized golf at times that work for their lifestyle, in a fun, non-competitive environment. Feb 1 – February 8, 2016 received the highest level of NCCP Coach of Developing Competitors Training from the PGA of Canada in Port St. Lucie, Florida. Offering Ladies Golf Clinics at the East Hants Sportsplex starting on March 23.